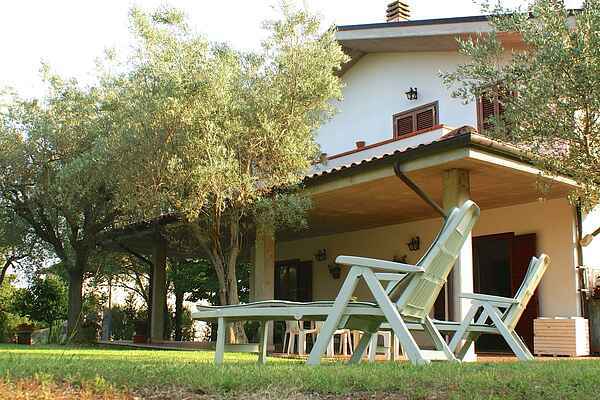 In the Teramana hills is a lovely detached villa with a garden. The house looks out onto an olive orchard and fruit trees. The house offers lots of privacy and makes an ideal base for exploring the area, spending a day at the beach or sampling the delicious local cuisine in one of the many little restaurants. The garden, which includes a rustic grassy field, is about 1500 square metres. The region is known for its Montepulciano d'Abruzzo, a fine wine with a long tradition, and the area is full of vineyards. This is a peaceful region between the Adriatic Sea and the Gran Sasso. Here you will find monasteries, churches, an archaeological museum and a necropolis from the 7th century B.C. A nearby residence with a restaurant has a swimming pool (14 x 7 metres, open from May to September) which is available for use by the villa's guests free of charge. The pool is 6 km from the holiday house.